Fundamentals of Petroleum Refining presents the fundamentals of thermodynamics and kinetics, and it explains the scientific background essential for understanding refinery operations. The text also provides a detailed introduction to refinery engineering topics, ranging from the basic principles and unit operations to overall refinery economics. The book covers important topics, such as clean fuels, gasification, biofuels, and environmental impact of refining, which are not commonly discussed in most refinery textbooks. Throughout the source, problem sets and examples are given to help the reader practice and apply the fundamental principles of refining. Chapters 1-10 can be used as core materials for teaching undergraduate courses. 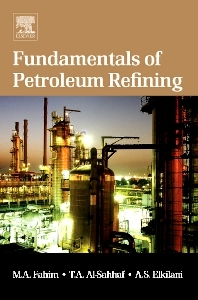 The first two chapters present an introduction to the petroleum refining industry and then focus on feedstocks and products. Thermophysical properties of crude oils and petroleum fractions, including processes of atmospheric and vacuum distillations, are discussed in Chapters 3 and 4. Conversion processes, product blending, and alkylation are covered in chapters 5-10. The remaining chapters discuss hydrogen production, clean fuel production, refining economics and safety, acid gas treatment and removal, and methods for environmental and effluent treatments. This source can serve both professionals and students (on undergraduate and graduate levels) of Chemical and Petroleum Engineering, Chemistry, and Chemical Technology. Beginners in the engineering field, specifically in the oil and gas industry, may also find this book invaluable.